Companies of all shapes and sizes have a blog on their website, of which they normally go to outside sources for their writing. Appealing to other bloggers and content marketers to contribute towards your blog is a huge plus for you as a blogger and has mutual benefits for all concerned. Google PageRank is established on bloggers verifying each others reputations. 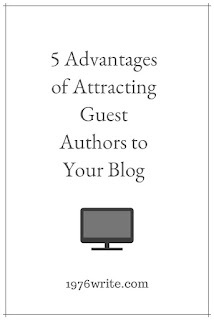 Guest bloggers are acknowledging your authority by writing a guest post on your blog. The more conspicuous the blogger the more your reputation will grow over time. It does your blog no harm if you find someone with more knowledge or experience than you have. It also gives your audience a fresh perspective on your chosen field. Writing is my passion and can be at times be tiring, resulting in writer's block. All writer's have this at some point, being able to draw on the odd guest post gives you oppotunity to recharge your batteries. When you start writing on your blog you gradually build a routine which can leave you without a new perspective. Attracting other bloggers to write a blog post will give your blog a different view. By opening the door to guest authors you may even return the favour by guest posting on their blog. This opens the door for opportunity and numerous possibilities, and better things in the future.